How to Live Forever…or Almost! Dr. John Day Talks Longevity. Did you ever want to know how to live forever? Well, I do! I read the most amazing book by Dr. John Day, The Longevity Plan, and I absolutely had to talk to him. Dr. Day studied an area with the highest concentration of centenarians in the world and came up with seven principles that are completely applicable to our western lives. 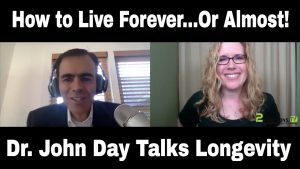 In this interview, Dr. Day and I discussed actions you can take today to extend your life. 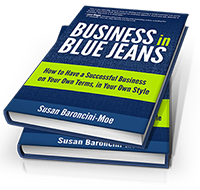 Susan Baroncini-Moe, author of Business in Blue Jeans: How to Have a Successful Business on Your Own Terms, in Your Own Style, is the CEO of Business in Blue Jeans, a digital marketing firm working with businesses to help them protect and manage their online reputations and gain market share through digital marketing strategies. Named one of The Top 20 Digital Marketing Experts for 2015 by Online Marketing Institute, Susan is a sought-after business and marketing strategist and executive coach. In 2012, Susan broke the Guinness World Records® title for longest uninterrupted live webcast, and she and her businesses have been featured in Redbook Magazine, USA Today, MSN Living, American Express Open Forum, Social Media Examiner, Investor’s Business Daily, and Yahoo Finance, as well as many other online and offline publications.